Rotator cuff tear in the tendon of the supraspinatus muscle. You've probably heard a lot about the rotator cuff...you might even have experienced a rotator cuff injury before. But what exactly is it? Why is it important? And how can we prevent (further) injury? The rotator cuff is a group of four muscles that are responsible for keeping the arm (humerus bone) attached the shoulder socket (scapula). The tendons of these muscles wrap around the head of the humerus, uggin the humerus to the shoulder socket. This is a tougher job than it might seem; our arms actually have a pretty shallow connection to the shoulder sockets. This shallow connection gives our arms a lot of mobility but not a lot of stability. It's one of the reasons why shoulder injuries are among the most common types of injuries and why everyone should invest a little more time in toning these highly functional muscles. The four muscles of the rotator cuff. The anterior view is the view from the front and posterior is from the back. Infraspinatus: Located on the back of the shoulder blade and arm bone, the infraspinatus is one of the largest rotator cuff muscles. This muscle outwardly (laterally) rotates the arm and horizontally abducts the arm (see below). Teres Minor: Teres minor is a smaller muscle located just beneath the infraspinatus on the back of the shoulder blade and arm. It also performs similar actions (lateral rotation and horizontal abduction) as the infraspinatus. Supraspinatus: This muscle is located along a groove near the top of the backside of the scapula and connects over the top of the arm bone. This muscle works to lift the arms out to the sides from a relaxed position (abduction - see below). Suprasinatus is the most commonly injured rotator cuff muscle. Subscapularis: Also a large muscle, the subscapularis connects from the front side of the scapula to the front of the arm bone. It inwardly (medially) rotates and horizontally adducts the arm at the shoulder joint (see below). By keeping our rotator cuff muscles toned, we can reduce the chance of injury to the area. If you've ever injured a rotator cuff muscle, then you'll know that strengthening these muscles is typially part of the recovery process once the area is healed. Below are five moves you can incorporate into your yoga practice (or workout) to keep these muscles in their best working condition. Keep your elbows as close to your sides as you can while you squeeze a block between your hands with as much energy as possible. Think about rotating your arms in towards your body as you squeeze. Hold for 10 breaths. Hold arms straight out and squeeze a block between your hands as strongly as you can. Hold for 10 breaths. Squeeze the block between your hands, bend your elbows 90 degrees, and lift the block up until your elbows want to spread apart. Work lateral rotation, aiming to keep the elbows closer together so the arms stay parallel. Hold for 10 breaths. 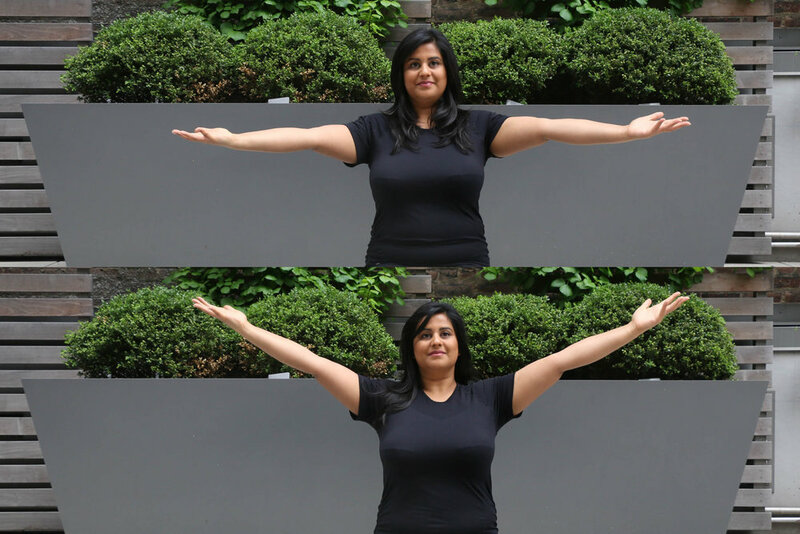 Begin by lying on your abdomen with arms out to a "T." On an inhale, lift your head, neck, shoulders and arms. Breath 5-7 seven breaths and lower down. Repeat 2 more times. Hold your arms up at shoulder height slightly in front of your shoulders. Rapidly lift and lower your arms. You can breath quickly or slowly. Set a timer and do this exercise for 1-3 minutes.